VANCOUVER, British Columbia, Sept. 10, 2018 (GLOBE NEWSWIRE) -- First Majestic Silver Corp. (“First Majestic”) and Evrim Resources Corp. (“Evrim”) are pleased to announce that the Ermitaño and Cumobabi project option agreements in Sonora, Mexico have now been exercised and that First Majestic has completed its 100% earn-in for both projects. In connection with the exercise, First Majestic has made a US$1.5 million cash payment to Evrim and has granted to Evrim, per the original 2014 option agreements, a 2% net smelter royalty (“NSR”) in the case of the Ermitaño project and a 1.5% NSR in the case of the Cumobabi project. The parties also announce that arbitration proceedings (previously announced on April 5, 2018) between Evrim and First Majestic have been terminated. The Ermitaño property consists of 16,526 hectares of mining concessions located adjacent to the Santa Elena claims which host the producing Santa Elena Main Vein and First Majestic’s 3,000 tonne per day processing plant. 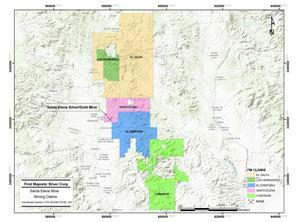 The Cumobabi property consists of 22,258 hectares of mining concessions located southeast of the Ermitaño property. A full property map of First Majestic’s concessions are shown below. Mr. Ramon Mendoza Reyes, Vice President Technical Services for First Majestic, is a Qualified Person as such term is defined under National Instrument 43-101, and has reviewed and approved the technical information disclosed in this news release. Evrim's disclosure of technical or scientific information in this press release has been reviewed and approved by Stewart Harris, P.Geo., Vice President of Technical Services. Mr. Harris serves as a Qualified Person under the definition of National Instrument 43-101. First Majestic is a mining company focused on silver production in Mexico and is aggressively pursuing the development of its existing mineral property assets. First Majestic presently owns and operates the San Dimas Silver/Gold Mine, the Santa Elena Silver/Gold Mine, the La Encantada Silver Mine, the La Parrilla Silver Mine, the San Martin Silver Mine and the Del Toro Silver Mine. Production from these mines are projected to be between 12.0 to 13.2 million silver ounces or 20.5 to 22.6 million silver equivalent ounces in 2018. Evrim is a mineral exploration company whose goal is to participate in significant exploration discoveries supported by a sustainable business model. Evrim is well financed, has a diverse range of quality projects and a database covering substantial areas of Mexico and portions of southwestern United States. Evrim’s projects are advanced through option and joint venture agreements with industry partners to create shareholder value. Evrim’s business plan also includes royalty creation utilizing Evrim’s exploration expertise and existing projects. This news release includes certain "Forward-Looking Statements" within the meaning of the United States Private Securities Litigation Reform Act of 1995 and applicable Canadian securities laws. All statements in this news release, other than statements of historical facts, are forward looking statements. Forward looking statements are statements that are not historical facts and are generally, but not always, identified by the words "expects", "plans", "anticipates", "believes", "intends", "estimates", "projects", "potential" and similar expressions, or that events or conditions "will", "would", "may", "could" or "should" occur. These forward-looking statements or information relate to, among other things: building of additional resources, new sources of production and estimates of future production. Although the parties believe the expectations expressed in such forward looking statements are based on reasonable assumptions, such statements are not guarantees of future performance and actual results may differ materially from those in the forward looking statements. Many factors, both known and unknown, could cause actual results, performance or achievements to be materially different from the results, performance or achievements that are or may be expressed or implied by such forward-looking statements or information and the parties have made assumptions and estimates based on or related to many of these factors. Such factors include, without limitation: fluctuations in the spot and forward price of silver, gold, base metals or certain other commodities (such as natural gas, fuel oil and electricity); fluctuations in the currency markets (such as the Canadian dollar and Mexican peso versus the U.S. dollar); changes in national and local government, legislation, taxation, controls, regulations and political or economic developments in Canada or Mexico; operating or technical difficulties in connection with mining or development activities; risks and hazards associated with the business of mineral exploration, development and mining (including environmental hazards, industrial accidents, unusual or unexpected formations, pressures, cave-ins and flooding); risks relating to the credit worthiness or financial condition of suppliers, refiners and other third parties; the presence of laws and regulations that may impose restrictions on mining, including those currently enacted in Mexico; employee relations; relationships with and claims by local communities and indigenous populations; availability and increasing costs associated with mining inputs and labour; the speculative nature of mineral exploration and development, including the risks of obtaining necessary licenses, permits and approvals from government authorities; diminishing quantities or grades of mineral reserves as properties are mined; title to properties; and the factors identified under the caption “Risk Factors” in First Majestic’s Annual Information Form, under the caption “Risks Relating to First Majestic's Business”. Investors are cautioned that any such statements are not guarantees of future performance and actual results or developments may differ materially from those projected in the forward looking statements. Forward looking statements are based on the beliefs, estimates and opinions of the parties’ respective management on the date the statements are made. Except as required by securities laws, the parties undertake no obligation to update these forward looking statements in the event that management's beliefs, estimates or opinions, or other factors, should change.